A holocaust story and a recent hate crime, two events separated by seventy years and apparently unrelated to each other except for the fact that they involved members of the author’s extended family. 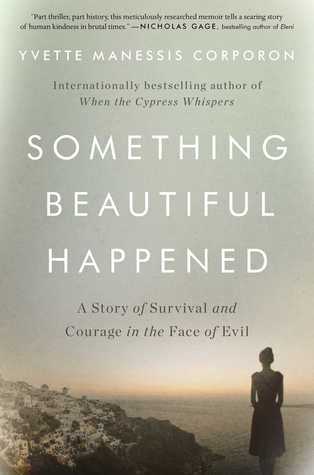 These events anchor this memoir to provide optimistic life lessons by honoring the good that can grow out of evil events. The author grew up hearing stories about her grandmother’s youthful years living on a small Greek island. Included with those stories was an account of a Jewish tailor and his daughters who were able to hide from the Nazis on the island during WWII. After her grandmother’s death the author became curious about this story and began efforts to locate descendants of this Jewish family. Just when this effort began to meet with some success the author received news that her nephew and his grandfather had been gunned down in a hate crime on April 13, 2014 in Overland Park, Kansas. This recent tragic event becomes part of this memoir's story while asking the question, how does one go on with life after events like this. The book describes efforts made in response to both events that were made to honor the good in life and spread better understanding in the battle against hate. As the author recounts these events we also learn about the history of removal of Jews from Greece by the Nazis as well as a description of the author's childhood as part of the Greek immigrant community in America. The book tells the story of the founding of the Faith Always Wins Foundation to promote "dialogue for the betterment of our world through kindness, faith and healing." It was founded by the mother and daughter of the nephew and grandfather who were slain in Overland Park. Also, the book's narrative climaxes with an account of a reunion of descendants of the WWII era story on the small Greek island to honor and memorialize the bravery of those involved with that incident. All these events are described with words saturated in emotion. Sign into Goodreads to see if any of your friends have read Something Beautiful Happened.